Best. Week. Ever. And I’m not just talking about #ninjaTED. 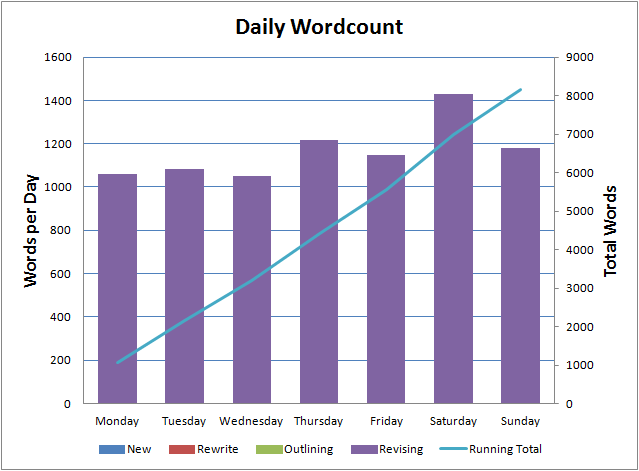 I made a concerted effort to break 1,000 words every day last week. The result – 8,170 words on The Ghost Smuggler. That’s 700 words short of my best week last year but still very good. It was really only possible because I’m writing a lot of new material for The Ghost Smuggler so I’m not expecting to keep up that velocity for long but it’s the sort of rate I want to hit as often as I can. This week, I need to write a new short story. I had what is (hopefully) a pretty cool idea while I was out running yesterday so that will take up a chunk of my time for the next few days.